Gamma NutraPlus Food Suspensions are easily digestible liquid foods suitable for all aquarium inhabitants. They are an ultra convenient way of getting all the benefits of Gamma Frozen Foods but without the need for a freezer. The liquid the feed is preserved in contains crustacean derivatives which also act as a coral food and feed trigger. Ready to use - can be added directly to the tank (no mixing or defrosting required). Naturals: These use a single natural food source which is suspended in water. 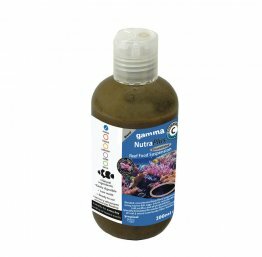 Simple and natural for all aquarium inhabitants. Blends: These use a blend of natural foods and other high quality marine derivatives, making them a good option for species requiring particular diets. Perfect for small fish and filter feeders. Mixes: These contain high quality ingredients including crustacean, plankton and marine algae derivatives. Perfect for corals and other inverts.